Well, to be honest, I believe partial agreement should exist here for those on both the continuationist and cessationist side. The agreement comes in that there is no more revelation that God would need to communicate with regards to His redemptive purposes in Christ. No more! Christ, his work and the revelation that comes in the new covenant are the final word on God’s redemptive revelation and purposes. Yet, I do believe that, in this discussion, it would be helpful to distinguish between that of 1) God’s redemptive revelation and 2) other revelatory communication. And I believe this is where continuationists will part from cessationists. But I hope this can at least bridge some of the gap that exists between the two perspectives. Again, I think it would be detrimental to say that there is still more for God to reveal in His redemptive purposes for all peoples beyond that which He has revealed in His Son, Jesus Christ. Christ and Christ alone is the final word on such. And, once more, this is testified to in the great canon of Scripture we have in both the Old and New Testaments. But, to believe God is still continuing to reveal today, giving non-redemptive revelation, should not be seen as harmful to a faith that looks to be grounded in that of Jesus Christ and the full canon of Scripture. Matter of fact, I would argue that to not allow for God to still speak and reveal today, in all His various manners, is to cut us off from something very dear to the heart of God, something that even Scripture points to continutation (I’ve written more on this particular topic here and here). 1) Even while the canon of Scripture was being formed, God was always speaking para-Scripture, meaning He was speaking alongside what would be formed into the canon of Scripture. In the first instance, we find Saul, empowered by the Spirit, prophesying amongst a group of prophets. 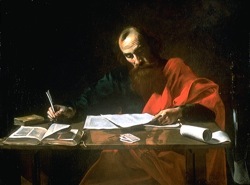 In the second example, we read of Paul reminding Timothy of the prophetic words that were made about him and that ‘by recalling them you may fight the battle well, holding on to faith and a good conscience’. In both situations, we find Spirit-inspired prophecy. But in neither case do we find those prophetic, and revelatory, words recorded in Scripture. The events are mentioned, but not the specific words. And we find that, even in the case of Timothy, these words enabled him to stay the course. They must have been some pretty edifying and strengthening words. And, of course they would have been since we find that a major purpose of prophecy (1 Cor 14:3). Remember, the Scripture does not record every word and act of God. That’s an easy one to recognise (i.e. John 21:25). But knowing that God was always speaking, acting, revealing Himself, even alongside the writing of canonical Scripture, this encourages us that He would not only do so para-canonical formation but even post-canonical formation. We can see plenty of these examples within the Gospels and Acts. For example, Jesus’ interaction with the Samaritan woman at the well (John 4). Here is the Word of God in flesh, and so we recognise the redemptive purposes of God being outworked through Christ, even in this particular occasion. But what is interesting to note one specific vehicle of revelation being used in John 4, mainly that of the prophetic word of knowledge about the women’s ‘love life’. Now, the details are no doubt extremely important in the interaction between Jesus and the Samaritan woman – she is a Samaritan, a woman, the words about living water, the shift towards worship of our Father in spirit and truth rather than a centralised place, and every other detail. I believe John recorded exactly what was pertinent to record about this encounter in helping us better understand his main thrust about Jesus Christ in his Gospel (i.e. John 20:30-31). But that specific vehicle of the prophetic word of knowledge (about her love life) was but one detail that had no bearings on the ultimate redemptive revelation as found in Jesus Christ, even in that situation. Jesus could have revealed a dream that she had the previous night. He could have laid forth another specific bit of knowledge about her life. The specific words were revelatory, but the specific prophetic communication would not have been any less from God had they been revealing something else about her life. If they had not been spoken, if they had not been recorded (like with the example of Timothy above), or if some other revelation had been spoken forth about the woman, it would not have somehow brought any change to God’s redemptive revelation in Christ. And, so, to claim that God speaks today, reveals today, that prophecy still comes forth today, also does not have to be seen as having any great consequence upon God’s redemptive revelation summed up in His Messiah as testified to in the canon of Scripture. Remember, this is finished in Christ. And this is where the biblical canon, the measuring stick of our faith, becomes extremely important. It helps us recognise such, even giving us a measuring rod by which we can hold up such post-canonical revelations and prophecies and visions. And, of course, there are plenty of other examples in places like the book of Acts – such revelations that were God speaking into situations, but if such communication had come forth via another means, it would not have brought any change to God’s redemptive revelation in Christ. And there would be other such examples. All of these were actual revelations given by God, but none of them had bearings on God’s great redemptive purposes and revelation in Jesus Christ. Therefore, this is why I believe it is worth distinguishing between redemptive and non-redemptive revelation. Of course, even non-redemptive revelation comes from our great redemptive God. But we have a finalised redemptive revelation in Christ and finalised canon of Scripture that acts as our great measuring stick for our beliefs and practices. Yet, noting God was always speaking para-Scripture and that all revelation is not redemptively binding, I believe we can allow for a theology that says God continues to speak today. Not just in a general leading or only via Scripture, though both are very true and important, but even specific revelations into our lives and churches and situations today. God has always desired such, has always done such, and we desperately need such as we, as the body of Christ, live out of our calling in Christ in the earth today. This entry was posted in Bible, cessationism, continuationism, God speaking, prophecy, revelation, Scripture and tagged Bible, cessationism, continuationism, God speaking, prophecy, revelation, Scripture. Bookmark the permalink.